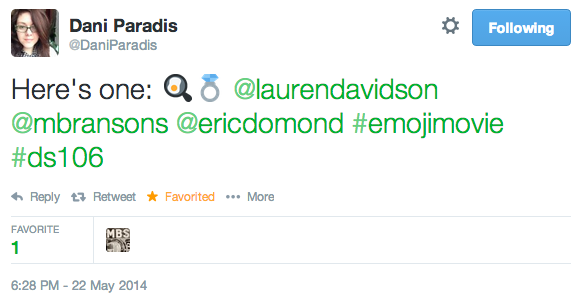 So I saw a tweet from Sava which was simply a single emojicon. A vehicle which was a while-driving-safe-texting-wink to her entering the radio city. But I really didn’t know that at the time. I just saw the little car in the tweet. And I was about to reply tweet with some random emojicons, finding it would be funny to respond with a bunch of arbitrary pictograms. But all of a sudden I was reminded of the four icon challenge, one of the early ds106 assignments which asked you to represent a film with four ‘iconic’ images. So instead I called to the ds106 storytelling folk, hoping they might be interested in playing a spontaneous version of the four icon challenge via Twitter using only emojicons. And I was so pleased to see the quick, righteous, and correct answer guessed by Dani Paradis (who I met at opened13). The four icon challenge was reduced to two emojis – shower head and kitchen knife = PSYCHO. Next Dani laid down her challenge. In the midst of trying to concoct another emoji movie challenge, Lauren Davidson jumped in and rang the winning bell with E.T. Yes the emoji movie guessing game was building a little audience so cool! And Lauren was gracious enough to take the next turn. Which Dani quickly answered, and hit the iceberg with – Titantic. Lauren followed with another challenge. Four ladies, the Union Jack, a microphone, and the world. Hmmmmm…. No clue. Dani? No clue either. Swoops in Eric Domond an unapologetic Spicy Girls fan with Spice World. And frying an egg in a pan plus a diamond ring?